COAST - Fighting for the taxpayers, not working against them! : SuperPAC Mailer #8 -- Jean Schmidt speaks with forked tongue! 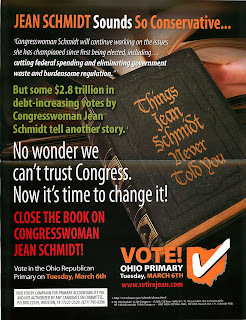 SuperPAC Mailer #8 -- Jean Schmidt speaks with forked tongue! Again, the creative team at Campaign for Primary Accountability is very good. Let's hope their efforts work Tuesday!